Summary: A new study reports Alzheimer’s disease does not appear to affect the salience network. 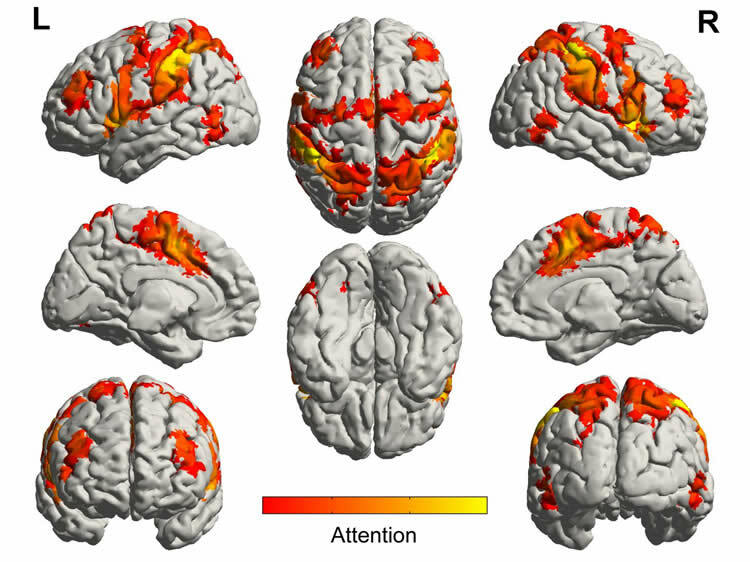 Researchers found, when listening to music, the salience network along with other networks, show higher functional connectivity in Alzheimer’s patients. Ever get chills listening to a particularly moving piece of music? You can thank the salience network of the brain for that emotional joint. Surprisingly, this region also remains an island of remembrance that is spared from the ravages of Alzheimer’s disease. Researchers at the University of Utah Health are looking to this region of the brain to develop music-based treatments to help alleviate anxiety in patients with dementia. Their research will appear in the April online issue of The Journal of Prevention of Alzheimer’s Disease. This is a diagram of brain networks involved in processing attention. NeuroscienceNews.com image is credited to Brain Network Lab. K.G. Jones, M. Rollins, K. Macnamee, C. Moffit, S.R. Naidu, E. Garcia-Leavitt, R.K. Gurgel, J. Amaro and K.R. Breitenbach at U of U Health and University of Utah, E. Goldberg from the Jewish Family Services of Utah, J.M. Watson from University of Colorado and M.A. Ferguson from Massachusetts General Hospital also contributed to this project. Funding: This work received support from A. Scott Anderson and the American Otological Society. Image Source: NeuroscienceNews.com image is credited to Brain Network Lab. Original Research: The study will appear in The Journal of Prevention of Alzheimer’s Disease. We will provide an update with the research abstract when it becomes available. University of Utah Health “Music Activates Regions of the Brain Spared by Alzheimer’s.” NeuroscienceNews. NeuroscienceNews, 27 April 2018. University of Utah Health “Music Activates Regions of the Brain Spared by Alzheimer’s.” http://neurosciencenews.com/music-alzheimers-8895/ (accessed April 27, 2018).